One year into Nissan's premium brand Australian relaunch and already prices are falling. The mysterious Infiniti brand of luxury automobile may be familiar to globe-trotting car-spotters as it's reasonably common on the streets of the USA. Remember back in 1989 when a smart new species of luxury limousine appeared on our streets as if out of nowhere? Yes, I'm talking about Lexus. And while the badge never made it to our shores, the sleek and futuristic Acura vehicles materialised on US and Canadian roads about the same time. It's all about perception. Toyota needed to be taken seriously as a builder of ultra-premium cars and move out of the 'trusted and reliable' headspace of Corolla and Corona. Enter Lexus. Same with Honda. Now Nissan are back in the fray with a relaunch of their own prejudice-busting brand, the big-ticket Infiniti. “Relaunch?” I hear you ask. Yes, you could be forgiven for forgetting Infiniti's first foray into the Australian market in 1991 when the Q45 full-size V8 luxury sedan was briefly here. It was meant, like Lexus, to go head-to-head with the big German brutes like the Mercedes S-Class and BMW 7-Series, but with a $140,000 price tag, the offensive withered. 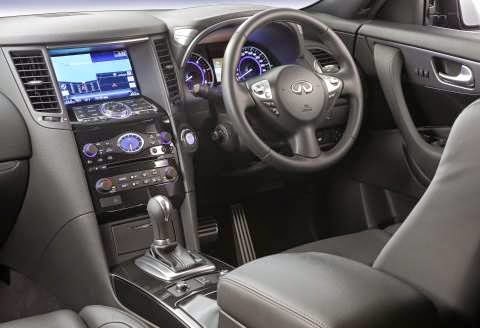 Now with Infiniti revisiting the UK market, a range of RHD models became available for export and we now have the G coupe and convertible, the M large sedan and FX mid-sized SUV. The cars all share the 'FM' platform, short for 'front midships' as in use for Skyline and 370Z sportscar. The futuristic-looking and boldly styled FX SUV is available with a whopping 290kW V8 as well as the more economical 3.7l V6, which we tested on an extensive, sealed road drive out to Mudgee. The low profile tyres and massive 20 x 8.0-inch alloy wheels means offroad is not really an option for this SUV. That said, the on-demand all-wheel-drive system and 7-speed auto is brilliantly stable and confidence inducing. If you want to bush-bash, get a Nissan Patrol. The 90-litre petrol tank didn't need refilling, so with careful highway driving, fuel consumption below 10l/100kms is achievable and quite remarkable for a two tonne petrol powered beast. City dwellers, however, can expect closer to 17l/100. The V6 is responsive and zesty with DOHC, variable timing, 4-valve technology putting out a respectable 235kW and 360Nm of caravan-lugging torque. Some of the driver assisting aids can be a bit hard to get used to with the audible lane guidance a bit like a nagging spouse until you know the secret to disabling it. Otherwise the interior is immaculate, featuring keyless ignition, supremely comfortable multi-adjusting electric seats with leather trim and oodles of boot space. For the driver, there's a virtual armoury of electronic aids from ABS to advanced traction and dynamic control that tames this beast. 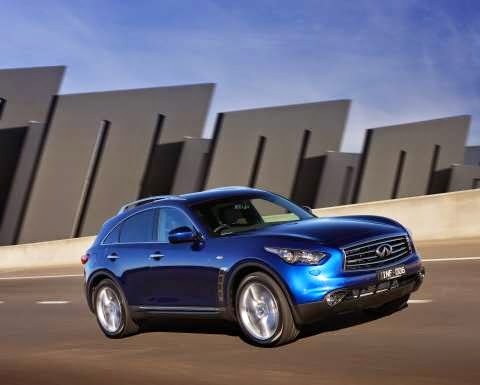 And in a consumer friendly footnote, Infiniti have just announced substantial price cuts across the range, lopping $7500 off the FX37 pricetag to $76,400.